Sept. 17-23 is Constitution Week. In 1955, the National Society Daughters of the American Revolution petitioned Congress with a resolution and this week of observance for the foundation of the American form of government was signed into law by President Dwight D. Eisenhower on Aug. 2, 1956. George W. Bush officially declared the inception of Constitution Week in 2002. The commitment of the NSDAR is to encourage study and educate the public about the Constitution, which was adopted by the American Congress of the Confederation on Sept. 17, 1787. Teach the public about the historical events surrounding the establishment of the Constitution and the men who framed the document. To celebrate the 63rd anniversary of the first resolution by the U.S. Congress to observe Constitution Week, the 231st anniversary of the signing of the Constitution, and the 227th anniversary of the ratification of the first ten amendments known as the Bill of Rights. Teach all citizens, especially youth and newly naturalized citizens, about the founding documents. Inspire all in the community to protect and defend the Constitution. 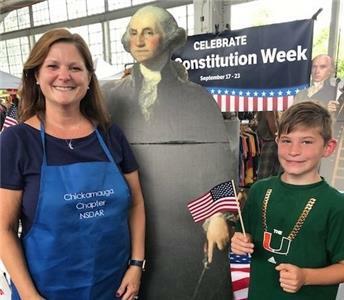 At the event, members displayed a large-format copy of the Constitution, distributed 500 pocket Constitution booklets, 500 American flags, and patriotic coloring sheets for teachers and children. Constitution displays were also installed for Constitution Week in the downtown Chattanooga Library and Signal Mountain Library. DAR has been the foremost advocate for the awareness, promotion and celebration of Constitution Week. This annual observance provides many opportunities for educational initiatives and community outreach, two mission areas of crucial importance to the National Society’s work. By fostering knowledge of and appreciation for the Constitution and the inalienable rights it affords to all Americans, DAR helps to keep alive the memory of the men and women who secured the nation’s independence, whose bravery and sacrifice made possible the liberties enjoyed today, said officials.